Sassy Bush Beans | Gurney's Seed & Nursery Co.
Tender, dark green beans are delicious, crunchy and have a great delicate flavor! The 4-5 in. long pods are the perfect size to use whole for fresh eating, canning and freezing. Vigorous plants produce outstanding yields of top-quality beans and are quick to set another crop after picking. Good resistance to bean common mosaic virus, anthracnose and curly top. 57 DAYS. Depth: 1/2 to 1 inch deep. Fruit: 4 - 5 inch pods. Seed is white. Soil Requirements: Well-drained loose enriched soil. 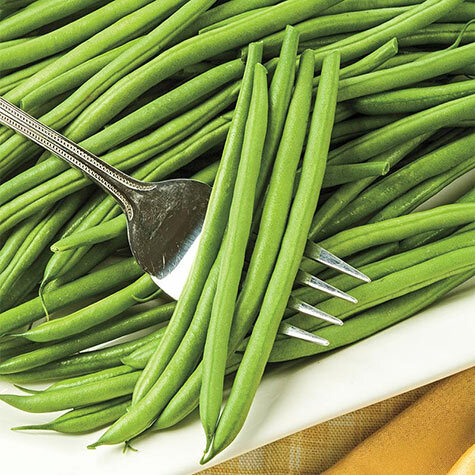 Comments: Tender, dark green bush beans are delicious, crunchy and have a great delicate flavor! The 4 - 5 inch long pods are excellent for fresh eating, canning and freezing. Vigorous plants produce outstanding yields of high-quality beans and are quick to set another crop after the first picking!